Our batch enrol tool allows you to easily add large numbers of students to your arbitrary Blackboard course. In order to use the tool you are required to paste in student usernames. One easy way to identify those students is to use WebSIS. Tick the user id text box so that user ids are shown in the results. Use the criteria boxes to find the students you wish to identify, e.g. all students on a certain module or studying a certain programme etc. Click on Download and you will be emailed a csv file of that data. Open the CSV file and copy the usernames. Paste the user ids into the batch enrol tool and follow the instructions on the batch enrol tool page. The rational for putting the year first is so that course tutors may differentiate between old and new courses. The course ID should take the subject code, course number, crn and year. These are courses that fall outside the Banner system, for example specialist courses, sub modular courses, project courses etc. Blackboard has a Course Catalog to organise courses held on the system. This may be viewed by clicking on the Courses tab along the top of the screen and then clicking on Browse the Course Catalog. All courses with full Banner codes have been assigned to the category in which they are held within the Banner central database. If you have an ‘arbitrary’ course, you may categorise it manually by following the five step guide below. Access the Control Panel and expand Customisation. Scroll down to Section 5 – Categorise Course. Scroll to the bottom and click on Submit. 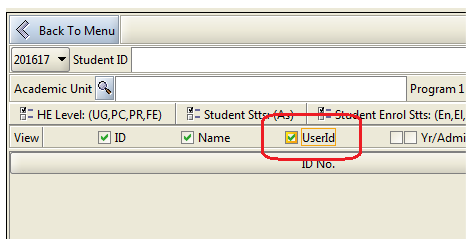 When you are ready to make your arbitrary course available to students you first need to set the enrolment options. You may wish to secure your course with a password. This password can then be given to the students who need it. If you do not wish students to self enrol you could add each of the students manually to your course. If you wish to make your Banner course available through self-enrolment this is also possible. An online guide is available for students, detailing how to enrol manually onto a course. 2. From the Control Panel, expand the Customisation menu and click on Enrolment Options. 4. If you wish you may set an Access Code to prevent people who should not access the course from doing so. Students will be asked to enter this code when they enrol themselves onto this Blackboard course. Note that the access code is case sensitive. If you set an access code you will need to tell your students what it is. Now that we have set the enrolment options we will make the course available. 6. From the Control Panel, expand the Customisation menu and click on Properties. 7. Scroll down to section 2. 8. Set Make Course Available to Yes. 12. Click on Submit to finish. Your course is now available. Inform your students of the access code they will need to use to enrol onto your course, and the name and code of your course so that they may find it in the Course Catalog. There may be occasions where you wish to add a large number of students onto an “arbitrary” Blackboard course. Blackboard now has a batch enrol feature, but the files it requires are not intuitive to create. We have set up a very simple tool that will create the required file for you. All you need to provide is a list of usernames of the students you wish to add to your course. You can extract lists of usernames according to the criteria of your choice using such tools as WebSIS and Discoverer. We have a specific guide on using WebSIS you may find useful. 1. Use the reporting tool of your choice to extract a list of usernames. 2. If there are more than 500 students break the list up into groups of no more than 500 each. 3. Copy the usernames and paste them into the box below. Each username should be on its own line and should not include @soton.ac.uk e.g. 4. Click on the Create Batch Enrol CSV File button and save the file on your desktop or other handy location. 5. Open your Blackboard course and in the Control Panel expand the Users and Groups section and select Users. 5. You will be presented with the Users page. Click on the Batch Enrol Users button. 10. Once the file has been processed you will be informed of any errors. The kind of error you may receive is where the username is incorrect, does not exist, or is already enrolled on the course.